“Neruda” (2016). Cast: Gael García Bernal, Luis Gnecco, Alfredo Castro, Pablo Derqui, Mercedes Morán, Emilio Gutiérrez Caba, Diego Muñoz, Michael Silva. Director: Pablo Larraín. Screenplay: Guillermo Calderón. Web site. Trailer. In many respects, every act of creation – no matter how great or small – could be considered an artistic undertaking. And, given that those creations ultimately originate from us, one could also say that we’re each artists in our own respect, even if we don’t always regard ourselves as such. But what does it take to successfully evoke the artist within each of us? That’s what the unusual new Chilean biopic “Neruda” seeks to address. In post-World War II Chile, poet and politician Ricardo Eliécer Neftalí Reyes Basoalto, better known by the pen name Pablo Neruda (Luis Gnecco), was the country’s preeminent Communist. As a member of the Chilean Senate, he represented a party that had steadily grown in popularity, especially among laborers, given the prevailing disparate social and economic conditions of the Latin American nation. Neruda’s inspiring poetry did much to fan the flames of the Communist movement, too, earning him a huge following at home and worldwide. High-profile supporters like painter Pablo Picasso (Emilio Gutiérrez Caba) spoke highly of the famed poet, further galvanizing the backing of his movement. However, with the rise of the Cold War and increasing suspicions about Communism, Neruda’s party was outlawed by the right-wing government led by President Gabriel González Videla (Alfredo Castro), a US-backed lapdog whom the poet had unwittingly help elect. With warrants issued for his arrest, Neruda was forced underground to figure out what to do next. One option was to leave Chile, and he even made an unsuccessful attempt to flee to Argentina. But, when emigrating became a less viable option, he opted to remain in his homeland to continue the fight, even if he had to do so in the shadows. And so, somewhat reluctantly, Neruda and his wife, Delia del Carril (Mercedes Morán), aided by their colleagues Victor (Pablo Derqui) and Álvaro (Michael Silva), went into hiding. With many of Chile’s Communists arrested by the government (and sent to prison camps in the desert, such as the one managed by eventual dictator Augusto Pinochet), President Videla believed he had the situation under control, with one notable exception – the capture of the fugitive poet. 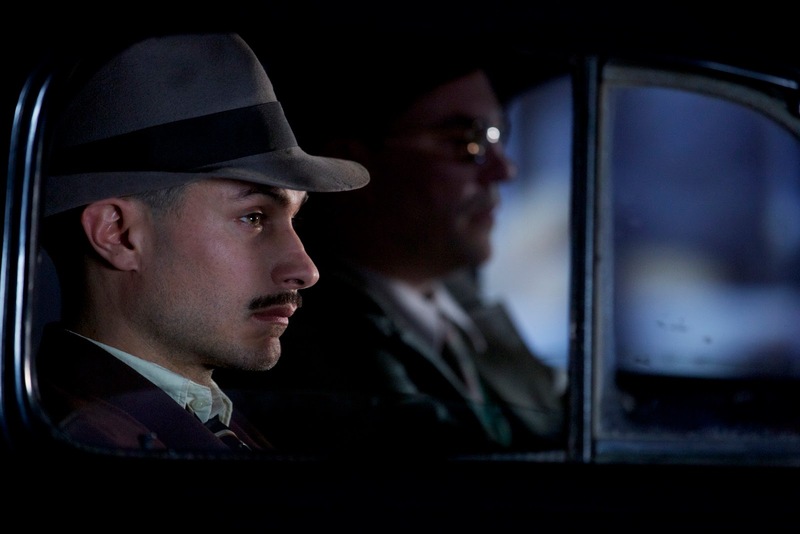 A warrant for Neruda’s capture was issued, and the task of finding him was assigned to a high-ranking secret police inspector, Oscar Peluchonneau (Gael García Bernal). Under threat of government arrest, Chilean poet and Communist leader Pablo Neruda (Luis Gnecco, center) goes into hiding with his wife, Delia del Carril (Mercedes Morán, second from left), with the assistance of their colleagues Victor Pey (Pablo Derqui, left) and Álvaro Jara (Michael Silva, right), in director Pablo Larraín’s inventive new biopic, “Neruda.” Photo courtesy of The Orchard. The handsome, young, immaculately groomed Peluchonneau believed himself to be the last word in criminal justice. In fact, he was so taken with his tenacity and investigative abilities that he saw himself as an artist of his craft, one whose talents in his own particular idiom equaled that of the renegade poet he was now pursuing. However, his pomposity and self-importance also often got him in his own way. Neruda recognized this, too, and he purposely began toying with Peluchonneau. As he stealthily moved from hiding place to hiding place throughout Chile, Neruda always managed to stay one step ahead of the sleuth and his ever-present lackey, Inspector Martinez (Diego Muñoz). He purposely left clues for his would-be captors, a gesture intended to brutally skewer Peluchonneau’s ego and undermine his resolve. In what becomes an ongoing game of cat and mouse that plays out across the Chilean landscape, Peluchonneau doggedly tracks his prey while Neruda, in turn, mischievously taunts him. Through this cross-country odyssey, viewers are clued in to the mindsets of each party, told primarily from the viewpoint of the inspector, who serves as the story’s narrator. Audiences hear the moving verses of a poet who inspired the soul of a nation, intercut with the pretentious, irrelevant, sometimes-incoherent observations of a conceited poser who fallaciously fancies himself the creator of what will ultimately be the quintessential investigatory masterpiece. Who will prevail in the end? That’s what remains to be seen. But, as with any artistic endeavor, no matter what the milieu, success depends on what we put into the effort. That’s particularly true when it comes to the input associated with our beliefs, thoughts and intents, the building blocks of the conscious creation process, the means by which we manifest the reality we experience. Neruda and Peluchonneau each bring their own unique talents, perspectives and convictions to bear in their respective pursuits, and they each attain their own singular results. In both cases, however, their outward, tangible materializations are always reflective of the inner, intangible sources of manifestation that inspired them. For someone like Neruda, an impassioned poet and an avowed Communist, he lived his beliefs, relishing everything that came from them. As an artist, someone who believes in uninhibited creative expression and freedom from limitation, he brought those convictions to life through his writings. Similarly, as a Communist, someone who (at least philosophically speaking) believes in fairness, equality and the removal of restrictions for all, he championed those notions through his verse, his political initiatives and the fervor he inspired in his followers. Neruda’s innate integrity for these principles, concepts deftly integrated into his beliefs, accounts significantly for his successes in these areas. Admittedly, some might label Neruda as something of a hypocrite, given that some of his ways, like his love of certain excesses, were decidedly bourgeois. But, at bottom, even those superficially antithetical creations were driven by the same fundamental beliefs in the removal of restraints and equal access for all that he employed in his other, loftier ventures. 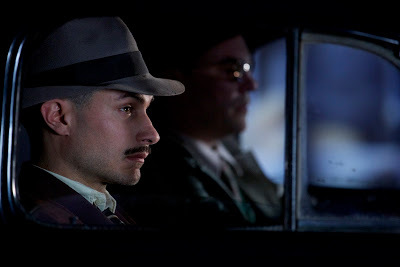 With the blessing of Chile’s right-wing government, secret police investigator Oscar Peluchonneau (Gael García Bernal), an immaculately groomed, self-styled master of criminal justice, doggedly pursues his prey, fugitive poet and renegade Communist Pablo Neruda, in the offbeat new biopic, “Neruda.” Photo courtesy of The Orchard. Meanwhile, for someone like Peluchonneau, an advocate for concepts like confinement and conformity (despite his alleged artistic leanings, whose liberating attributes would seem to run counter to such restrictive notions), he sought to impose his penchant for limitation on those, like Neruda, who refused to comply with the dictates of officialdom. He was hell-bent on fulfilling his quest, no matter what the cost. Yet, since Peluchonneau also saw his work as a creative undertaking – one that embodied the same kinds of freeing qualities embraced by the renegade artist – he attempted to manifest circumstances driven by inherently contradictory beliefs, a surefire recipe for failure or distorted outcomes. Since he held so fervently to both sets of intents, he failed repeatedly to attain what he saw as his ultimate goal. One could argue that, from a conscious creation standpoint, given his fundamentally conflicted mindset, he got exactly what he espoused (although he probably would have vehemently disagreed with such an assessment). Considering where each of the protagonists is coming from, is it any wonder that Neruda was able to outsmart Peluchonneau at every turn? He was true to himself and his beliefs, while his worthy opponent was innately conflicted, routinely falling short of the mark in attaining his hoped-for goal. But, then, as noted above, when we embrace the liberating beliefs that characterize artistic sensibilities, those intents will be faithfully reflected in the outcomes we realize, even if they’re not what we thought we were setting out to achieve. When we give ourselves over to the freeing effects afforded by such beliefs, there’s no telling what else we might be able to accomplish. Neruda’s accomplishments speak for themselves in this regard, taking him, his art and his politics to places he may have never envisioned, exceeding expectations and leaving a lasting legacy. Now that’s real liberation. Just as he did in “Jackie,” the recently released profile of former First Lady Jackie Kennedy, Chilean director Pablo Larraín has once again creatively and significantly redefined what constitutes the biopic genre. This inventive, semi-surrealistic, sometimes-campy, often-hilarious chronicle of the manhunt for the fugitive artist tells its story with gorgeous, noir-esque cinematography and plays out almost like a live action version of the exploits of the Road Runner and Wile E. Coyote. It’s an excellent showcase for Gnecco and, especially, Bernal, who really shows his range here, portraying the arrogant, self-assured sleuth like a suave yet somewhat-bumbling version of Clint Eastwood’s Dirty Harry Callahan. In these regards, the picture undeniably pushes the limits of what one typically expects from films in this category, but it does so in such a stylish, refreshing, creatively written way that it’s hard not to like this innovative offering. 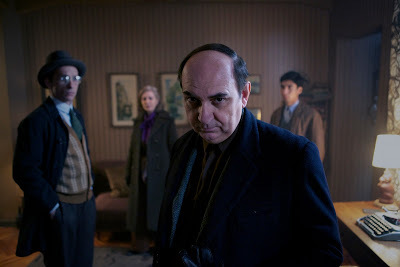 In so many respects, “Neruda” is far from typical, but it’s delightfully inspiring and immensely entertaining to watch. 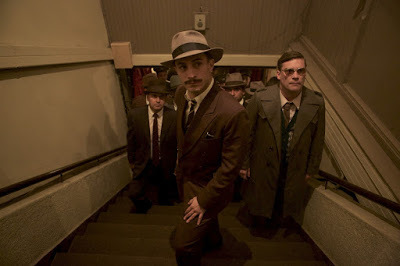 Secret police investigator Oscar Peluchonneau (Gael García Bernal, center), accompanied by his ever-faithful colleague, Inspector Martinez (Diego Muñoz, right), chases his prey, fugitive poet and renegade Communist Pablo Neruda, across Chile in the offbeat new biopic, “Neruda.” Photo courtesy of The Orchard. This film is certainly earning its share of accolades as well. In this year’s awards season competitions thus far, it earned best foreign language film nominations in the Golden Globe and Critics Choice Award contests. It has a good chance of capturing similar honors in this year’s Oscar nominations as well. When we seek to let loose the artist in each of us, we should be aware that we’re liberating more than just our faculties for the methods and materials with which we work; we’re also liberating ourselves, the creative spirit that takes us and our ideas to places we’ve likely never visited before. To make the most of the experience, though, we should be willing to give ourselves over to the process, unhindered by the conflicting notions or unduly restrictive limitations that might prevent us from achieving the results we desire and that keep us from living up to our full potential. The difference between being willing to do so and not is akin to the differences between Neruda and Peluchonneau as they’re depicted in this film. So, in light of that, then, the critical question thus becomes, which would you choose? And, in doing so, be sure to consider the examples set here when making your decision.